I’ve seen art cars in the past but today’s combination might take the cake. 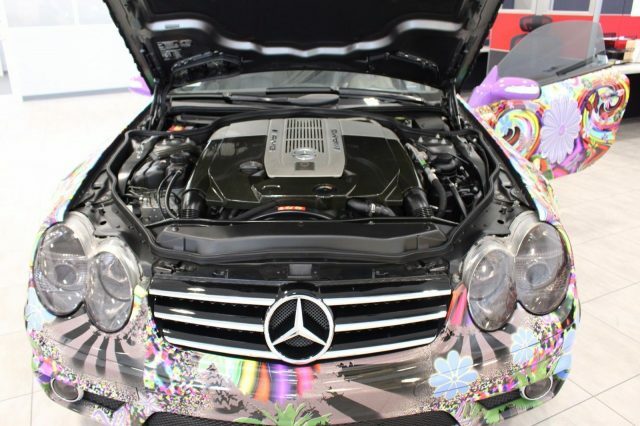 This 2007 SL65 AMG is the creation of a man who is considered a pioneer of digital art, Laurence Gartel. 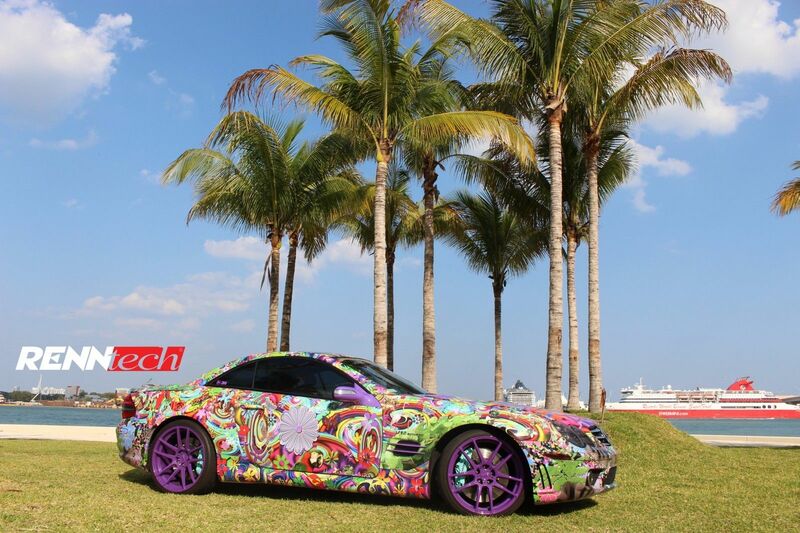 Gartel has done work with the likes of Andy Warhol, major household brands, celebrities, NASA, the Grammys and of course unique cars. 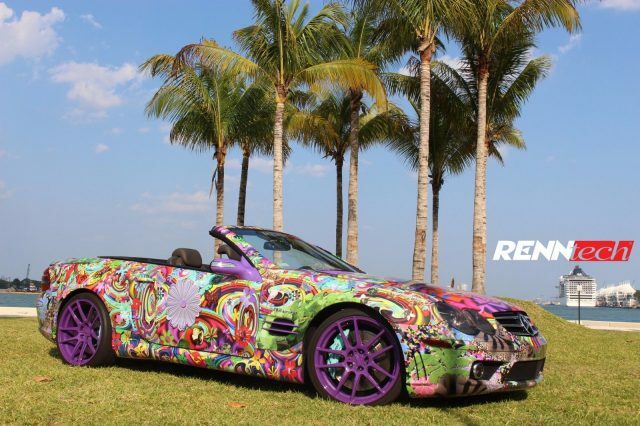 This latest art car is none other than the torque monster itself, the W230 SL65 AMG. Of course, just being a regular SL65 isn’t enough. 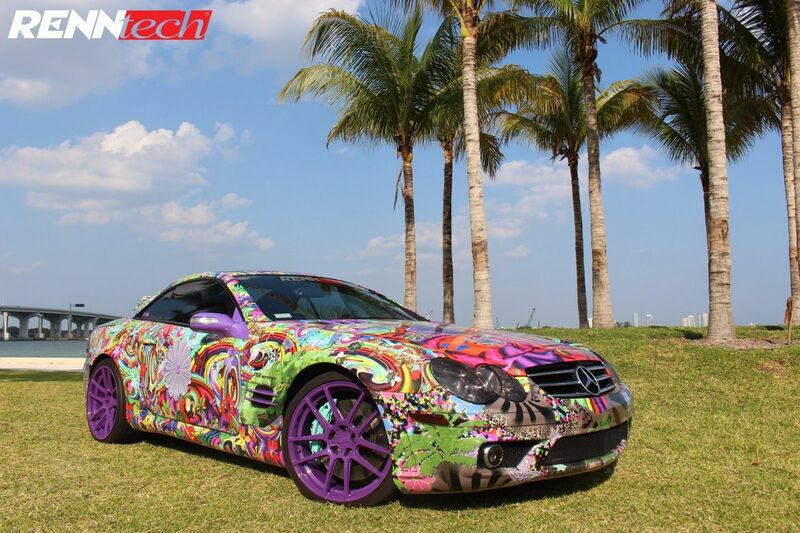 This SL was sent to RENNtech in Florida and came back with an always mind-blowing 670 horsepower and 840 lbÂ·ft of torque thus probably making this the fastest piece of rolling art out there. I’m not art aficionado by any means but Laurence Gartel is actually a name I’ve run across before. 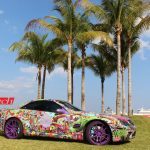 A quick Google search showcases some pretty interesting stuff he’s produced and his past art cars are pretty wild stuff as well. 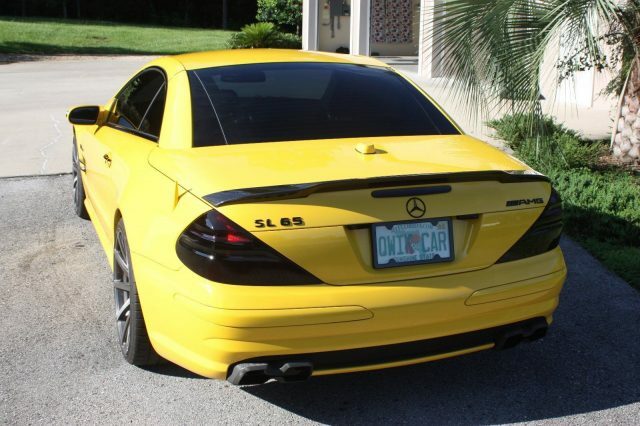 But in my opinion, this SL65 doesn’t do it for me. 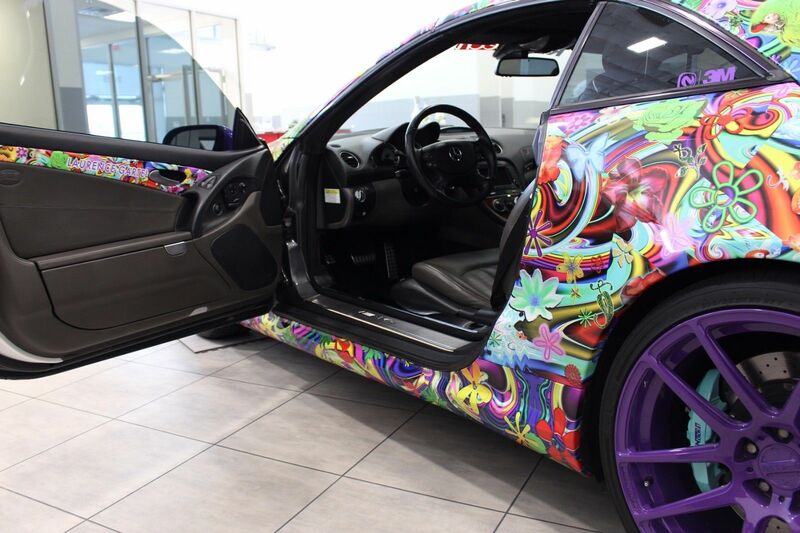 I’m sure there is a method to this madness that I’m missing or don’t truly appreciate, but it just a bunch of psychedelic patterns applied to a wrap that’s started to show its age. 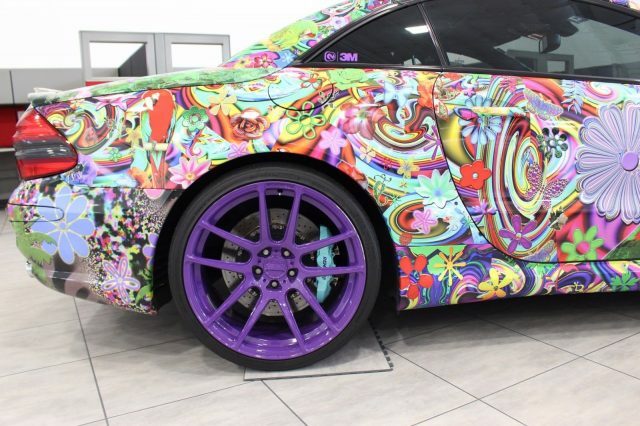 The shock value isn’t there anymore and cars like this are popping up everywhere from people designing wraps in their basement and applying them in a weekend. 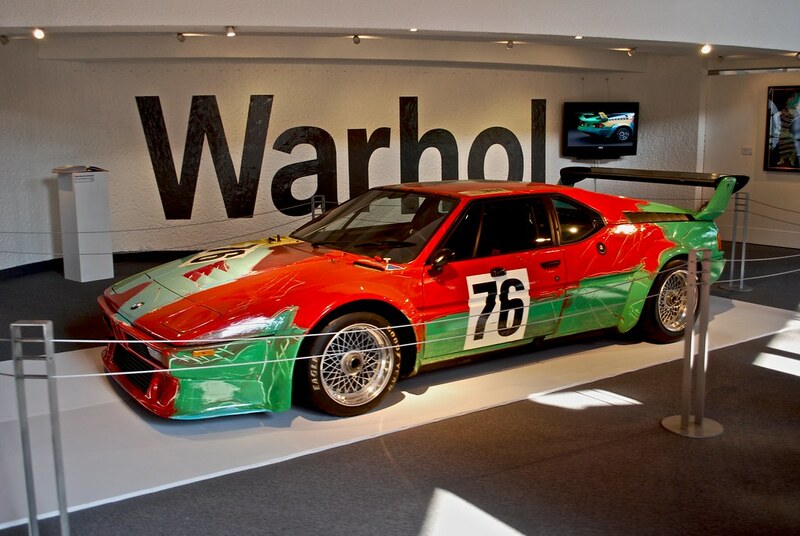 If anything I think the appreciation for something like Warhol hand painting an M1 only goes up because of how easy it is to do an art car now. Of course this is just my opinion, I welcome anyone who feels differently. As for the SL65 itself, I’m pretty amazed that it is nearing the 100,000 mile mark. I usually don’t see these with mileage like this one because they are either driven sparingly or owners reach a point where they are given a repair bill for five figures then decide to walk away from it. Seeing as this one is a show car that’s probably be driven to a fair amount of events and showcases, I guess I shouldn’t be surprised. Also you probably aren’t owning this car unless you like been seen either. There is no hiding in this thing. 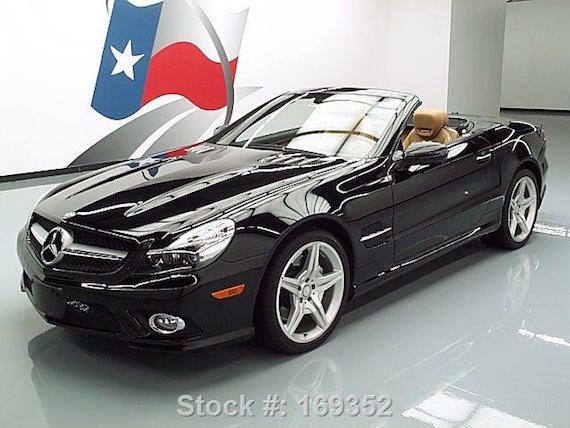 The price of this SL65 is really intriguing to at just under $40,000. 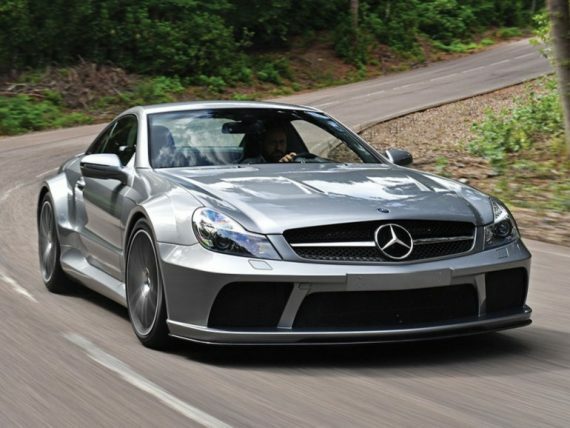 I looked at another SL65 AMG RENNtech back in January that finally sold for $46,000 but it had a faction of the miles this car has. 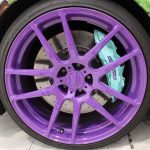 Seeing as RENNtech themselves is the one listing this car, they know what they have and what kind of market they are dealing with. Despite its huge power numbers, the potential for crazy repair bills on the M275 AMG cars have been sinking values on them with no real floor to be seen yet. This car is a tough sell even without the wrap because of the mileage so if I were to bet this one might sit for sale a little while longer. Nevertheless, a cool piece that you surely don’t see everyday. Ever see a certain car and say to yourself “I didn’t know they made those in that color”? Well, today is one of those cars. The R230 SL65 AMG is already famous for its extreme amount of power and its potential for costing an extreme amount of money on maintenance and repairs. 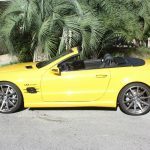 With this specific SL65 for sale in Florida you are getting a one-of-one color in Ferrari Giallo Modena and some extra goodies from the madmen at RENNtech. This is a beautiful piece of art on wheels. The car is amazingly fast yet still comfortable to drive everyday. The car was the only car to be painted this color yellow at the factory. It has been well cared for and garage kept in air conditioning. All maintenance has been regularly done at the dealer. Also included are the wheels that were taken off. 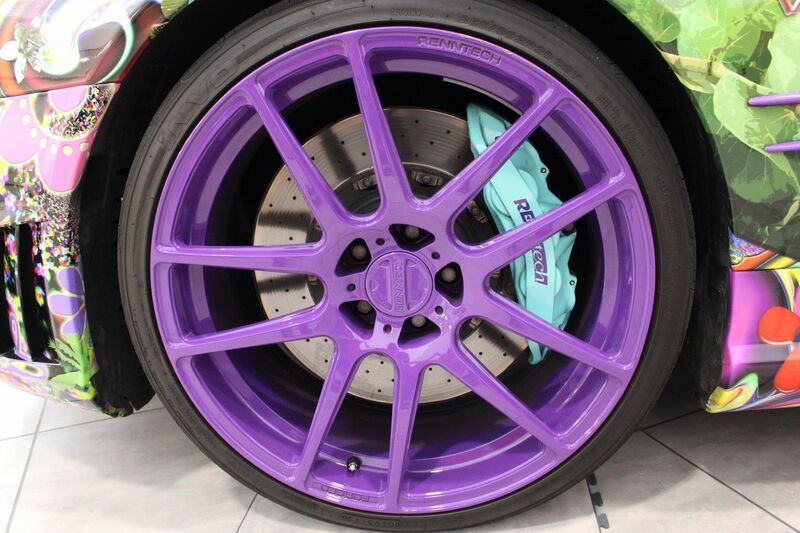 They were custom painted to match the car. They have some age on them and will need to be repainted. If you want them they will go with the car. The person who ordered this car is the same kind of person who goes to the self-serve frozen yogurt place and gets all the toppings just because they can. It wasn’t enough just to spend the $185,000 on the basic car (which isn’t particularly basic). 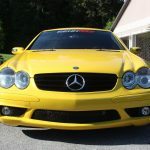 It needed the Ferrari yellow paint, a set of aftermarket wheels and to top it all off, a trip to RENNtech that resulted in a bill of $50,000. 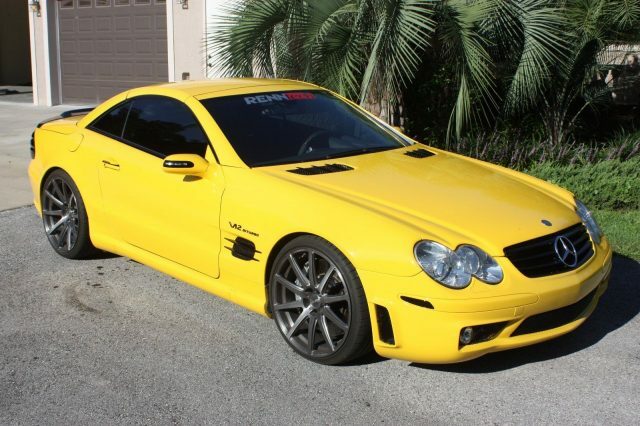 Judging from the sellers description, this SL65 has the R3 Performance Package which gets you 700 horsepower and 900 foot-pound of torque. That $50,000 also got you a handful of carbon fiber parts and another set of wheels for good measure. I don’t know what to make of this car. On one hand, it is extremely fast. The 0-60 time creeps into hypercar territory without the multiple six-figure price tag. 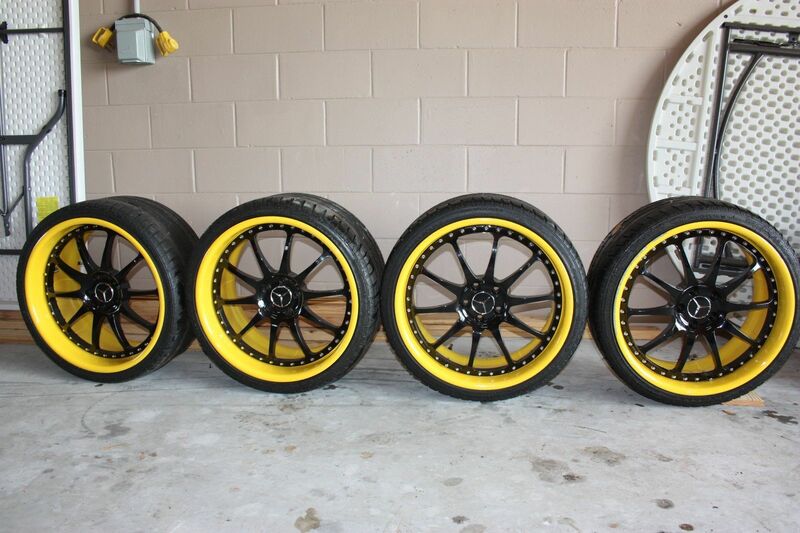 On the other hand, there is a reason why yellow wasn’t a factory production color. It feels like everyone on this SL65 had to be “touched”. The owner couldn’t leave well enough alone. All the badges had to be black, the taillights needed to be smoked, all the silver trim was painted and even the corner markers were blacked out. Of course all of this is just my personal taste and it probably suits the wants of some people out there. At an opening bid of $40,000 you are getting quite a value but fair warning, you’ll be paying Ferrari service prices to go along with the Ferrari paint. The last year of theÂ R230 SL in 2011Â gave you a color choice of white, silver, gray, silver, gray, silver, black, black, black and two different shades of red if you wanted to really getÂ wild. So when I saw one in Mauritius Blue it sure caught my attention. 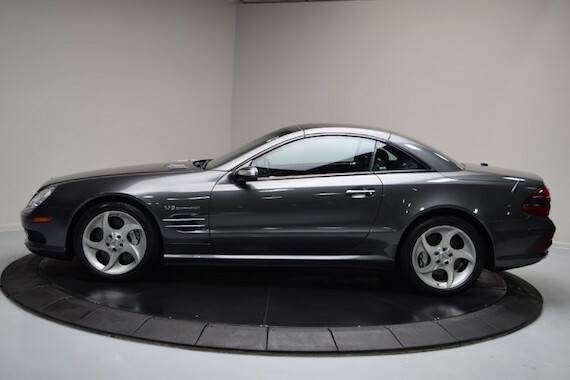 This wonderful SL550 for sale in North Carolina takes the normally bland color palette and adds a great color from it’s Designo program. 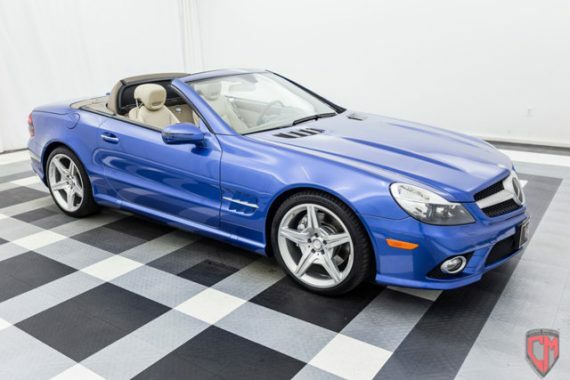 So let’s take a closer look at this blue-blooded Mercedes-Benz. 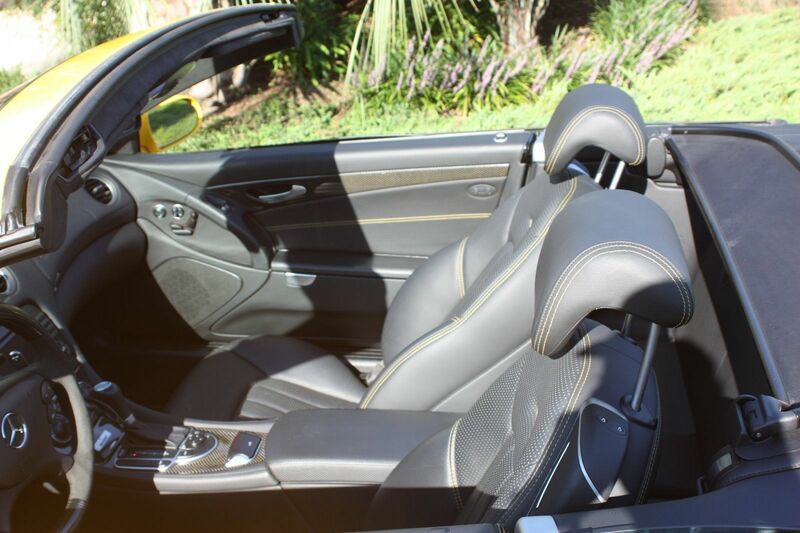 The R231 Mercedes SL has been with us for about three years, and I have to say that it hasn’t grown on me at all. Neither the exterior nor interior aesthetics do anything for me. 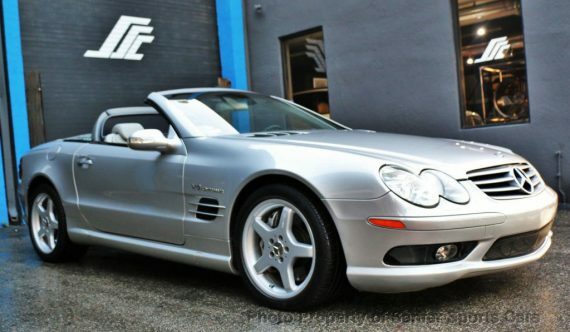 Having said that, I think the previous generation SL, the R230, is one of the best looking cars Mercedes has ever made. 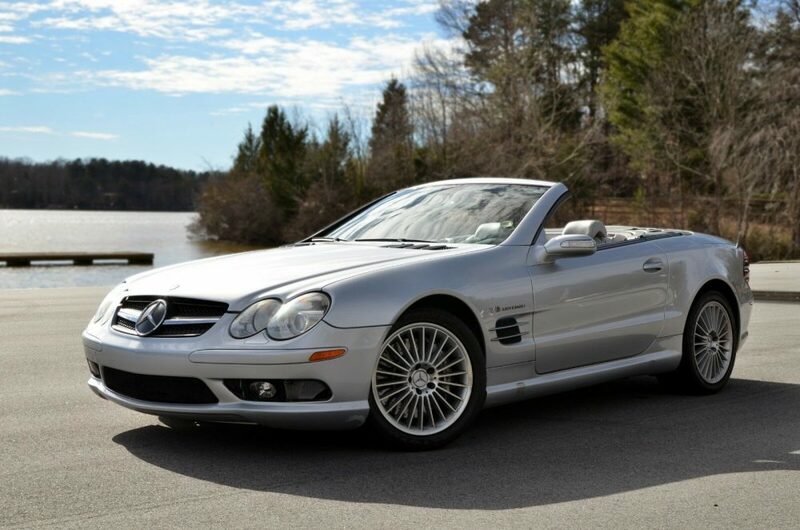 Released in the U.S. market in 2003, the R230 spanned a relatively short production life for a Mercedes SL. Its predecessor, the R129, was produced for twelve years, and the R107 lasted for eighteen years. The R230 received a debatably successful facelift in 2009, which gave the previously rounded front fascia a more rigid appearance, and tweaked a few stylistic details both on the interior and exterior to give the car a more aggressive appearance. 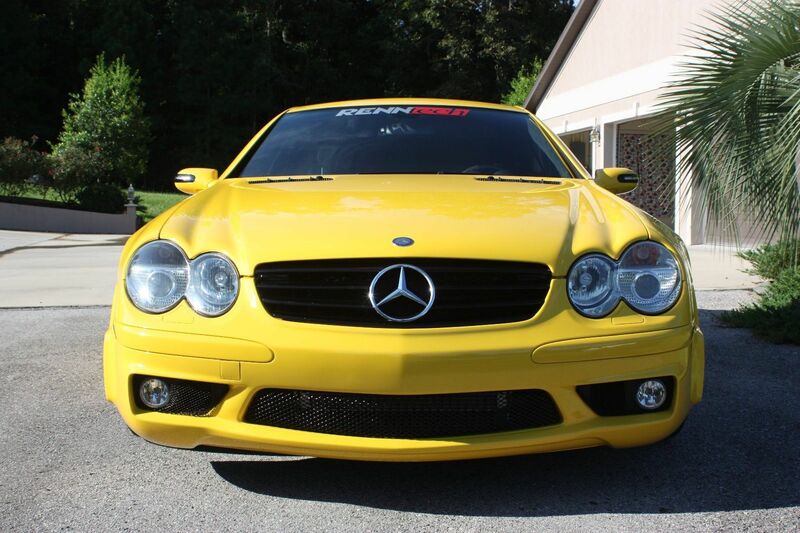 The facelift divided many Mercedes enthusiasts, but the general consensus was that the R230 was still a beautiful car. 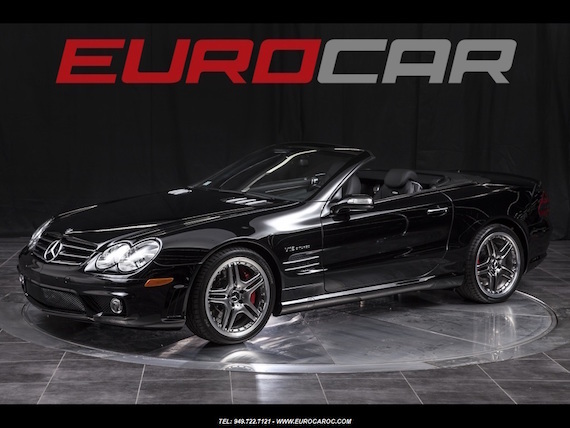 Today I’d like to go over some of the details on this very attractive 2012 SL550. 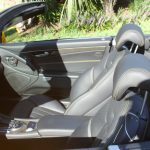 2012 was the last year of production for the R230 SL, which was offered in three derivations for the U.S. market; the SL550, and the AMG-tuned SL63 and SL65 models. 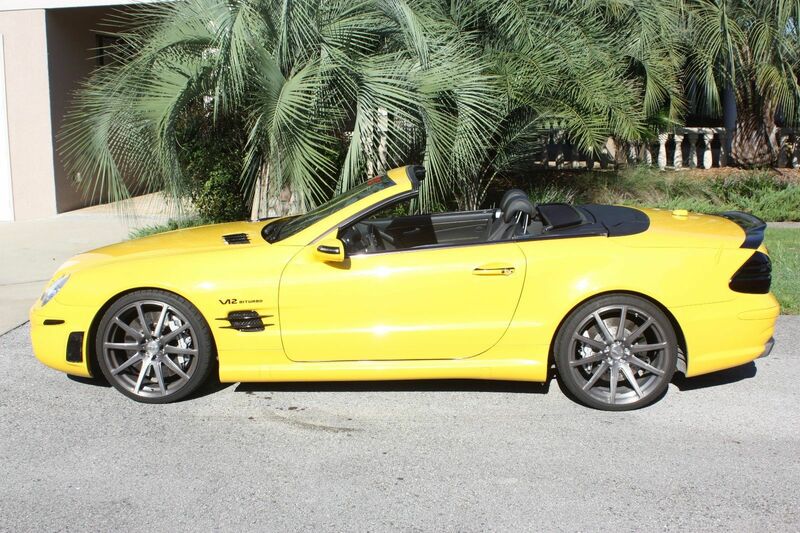 Not many AMG SL’s were sold in 2012, but there doesn’t appear to be a shortage of final year SL550’s. This particular one is finished in my favorite color combo of black on tan, and appears to be in great shape. 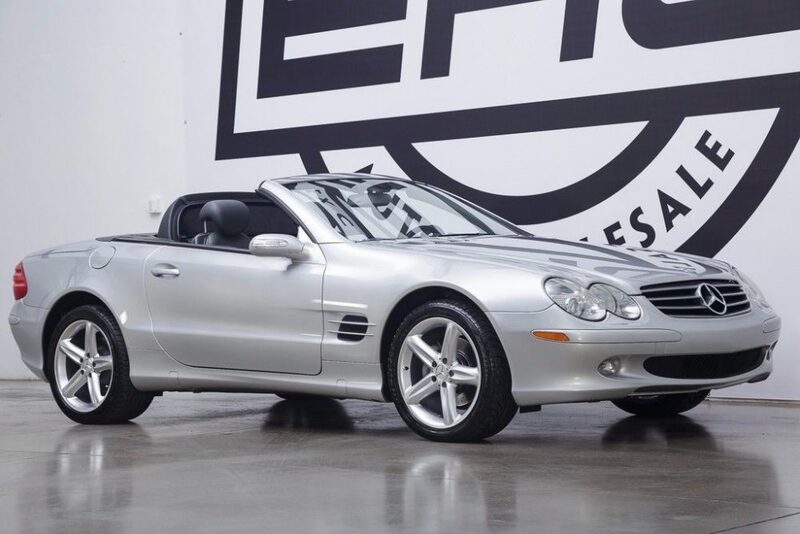 With only 17,000 miles, this is about as close as you can get to picking up a brand new R230 generation SL. One of the things I’ve liked about moving back to Washington State from the SF Bay Area is that seeing rare, expensive cars is special again. Living next to the most expensive zip code in the country meant that pretty much every luxury car was the top-of-the-line model, from BMW M5s and Alpina B7s to Audi S8s and RS7s to Mercedes-Benz E/S/CLS/SL/ML/G/GL63s and 65s. I got desensitized and disdainful, scowling at the 80 year olds puttering around El Camino Real with 500-600hp on tap. The Mercedes AMG 65 models always caught my attention with their gunmetal wheels as the main giveaway besides the badges, a nearly $200k car just hanging out next to the yoga studio and completely unnoticed by the general public. Well, they were roughly $200k when new. Depreciation hits them harder than their (transmission-limited) 738 lb-ft of torque and now this twin-turbo V12 GT is roughly a third of its original price. They’re not the most attractive roadsters, but it’s certainly a more balanced design than the “umm… copy-paste-update new shape here!” look of the current R231 SL. This R230 looks a bit more classic in black on black and has the Panoramic Roof option on the folding top so you can see the sky without exposing yourself to the commonfolk. Carbon fiber puts a performance veneer on the interior, but this will never be a canyon carver. It’s a 604hp highway bomber, and hopefully having covered fewer than 12k miles will keep scary-expensive maintenance on the V12 at bay for a while.